A new study in Texas has found that qigong, an ancient mind-body practice from China, reduces depression and improves quality of life in women undergoing radiotherapy for breast cancer. This is the first study to examine qigong in patients undergoing radiation that follows up to see what happened over time. We know that mind-body practices like meditation and guided imagery reduce stress and appear to improve quality of life, but the benefits during radiation have been fuzzy. Qigong is 4,000 years old and is based on synchronizing one’s breath with various exercises. It is a series of slow, defined movements and postures. The best-known form of qigong is tai chi. ALSO: Five qigong moves that are truly impactful. For cancer patients, it’s imperative to manage stress, which can have a tremendously negative impact on the body and its capacity to fight the tumor. In this recent study, researchers randomized 49 breast cancer patients to do qigong (five 40-minute classes a week) and 47 women to receive standard care for five or six weeks. Patients performing qigong reported a steady decline in depressive symptom scores beginning at the end of radiation therapy. No changes were noted in the control group over time. Qigong proved especially helpful for women who had higher levels of depression, fatigue, and poor quality of life at the beginning of the treatment. Cancer patients must not lose hope. What your mind perceives is happening, your overall outlook, bears actual weight on your treatment. 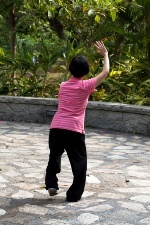 Qigong can be used safely by anyone undergoing cancer therapy to lift the mind into a more positive frame. Chen, Z., et al., “Qigong improves quality of life in women undergoing radiotherapy for breast cancer,” Cancer, published online January 25, 2013.